Smart Training has helped thousands of 16-18 year olds find entry into employment, Apprenticeship opportunities or supported getting them into their chosen college if they didn’t meet the required entry requirements. We promise to spend one day a week helping you to get ready for the world of work, support your Functional skills abilities in Maths and English, plus two days voluntary placements in your chosen industry with constructive feedback and the possibility of finding employment. To help with all this we can also pay towards your travel costs, lunch and even free breakfast on your study day. We have rich experience and expertise gained from working with a wide variety of employers including The Great British Library, Just IT, Blue Inc, Snappy Snaps, to name just a few! We are very pleased to announce that we are opening a new group in the London Borough of Southwark and will be running an Open Day on September 25th From 10am until 4pm at John Harvard Library, 211 Borough High Street, SE1 1JA where people can come along and get a better understanding of what we deliver. We will also be running an Open Day for our Stratford based group on the 26th September at Stratford library, 3 The Grove, London, E15 1EL. Last year we helped 80% of our Trainees move forward with their career and life goals. 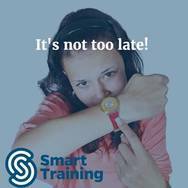 To book in to see one of our specialist Account Managers, please email Start@Smart-Training.com or call them 0203 700 4294 or just feel free to pop along!